Bladder campion may be found under three different forms of reproductive organs: dioecious; plants having only male flowers or only female flowers, monoecious; plants carrying both sexes in separate flowers, and finally, the most common, the plants with hermaphrodite flowers or perfect flowers, flowers with the organs of both sexes (stamens and pistil). 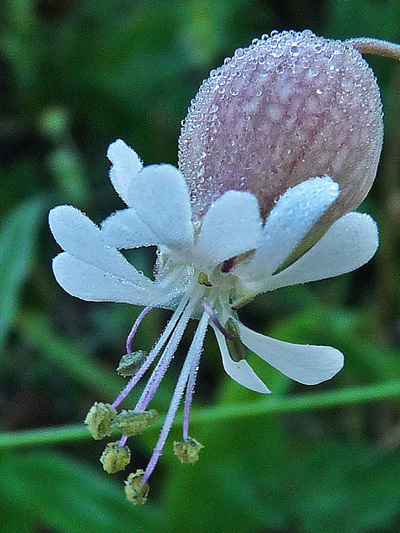 Silene vulgaris is introduced since a long time. In certain regions of Quebec it has the appearance of a native plant (St-Lawrence Valley). Leaves "soap" as those of the Common Soapwort. © 2006-2019 Flore du Québec All rights reserved.